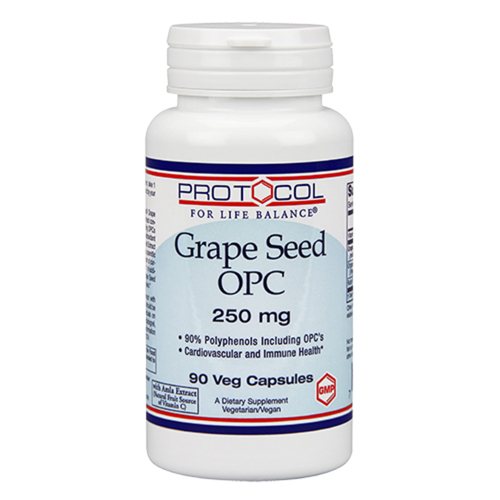 Grape Seed OPC 250 mg made by Protocol for Life Balance provides a dose of Vitamin C alongside Grape Seed Extract and Organic Amla Extract. Advertências: Keep out of reach of children. Do not take more than recommended dosage. Consult with your healthcare provider before starting this or any other dietary supplement. Do not take if safety seal is broken or missing. Recomendações de uso: As a dietary supplement, take 1 capsule 1 to 2 times daily with food or as directed by your healthcare practitioner. Protocol for Life Balance Avaliações de Clientes.